With her family shamed and her faith shaken, Riley Drake carries a heavy burden. She returns to Bayou La Foudre Parish to clear her brother's name, but her mission proves difficult and dangerous. The locals are convinced he's guilty of the tragic bombing that left the town in mourning, and she finds her only ally is Jake Ayers. Frustrated and fascinated by the parish's brooding sheriff, Riley hopes she's found someone to trust with her burden...and her heart. Sheriff Jake Ayers wants peace and healing in his parish, but Riley's presence stirs tempers into a frenzy. Most of the townsfolk want her dead. Emotions run deep in the bayou, and Jake's are no exception. Keeping a level head and an indifferent heart is going to be as difficult as keeping Riley alive. I used to think of the bayou as a place of peace until that night on the black water; when the air heated so fast and so furious that the wet steamed right off me. The dark night lit up with a bloom of raging red and orange. The night the thunder stole my brother. I thought about Randy and what he did on that terrible day almost a month ago as I lay in the canoe. It bobbed lazily underneath the low hanging branches of the cypress tree rocking me in my dark thoughts. Moored to the floating dock, I wasn’t going anywhere, so I leaned back in the bottom of the craft. I turned my face to the moon hanging low in the purple sky and listened to the cicadas and frogs along the bank. Their night song, low and steady, hummed its way along the misty water of the bayou. A plaintive cry of a loon tore through my raw nerves and sent me into another fit of sniffles and tears. My new faith, barely months old, shuddered within me. I don’t know how to do this, Lord. I don’t know if I can. Footfalls on the wood planks made me catch my breath. I wondered who found me so fast. “You promised you wouldn’t come back here.” The unmistakable voice, thick with the drawl of a man born and raised on the bayou, floated to me on the warm night air. I lifted my head and peered over the lip of the canoe at the man standing on the dock. Jake Ayers. His dark eyes captured mine, held them for a second, and then looked away. The anguish rolled off of him in dark waves, chilling me despite the summer night. Bayou La Foudre was his home and my brother, a disturbed young man, had blown up a chemical plant in Jake’s parish, killing twelve people and dying in the blast himself. My breath caught when I saw the sorrow etched under Jake’s eyes. So much heartache there. “Nous ne sommes pas amis.” He hooked his thumbs through the gun belt at his waist and shrugged. The dark brown Sheriff’s uniform outlined his tall stature against the lights from the dock. He kept his gaze on the dark water. “We’re not friends, Riley.” He pronounced it rah-ley, like he didn’t realize my name had no ‘a’ in it. I smiled sadly. This place felt so foreign. Louisiana and I would never be friends. I turned my head, wanting to see what he was looking at. Tiny lights flickered and bobbed over the surface of the swamp; lightning bugs. I honestly need to know. Reluctant to leave the safe cradle of the water and trees, I sighed and let Jake help me off the boat and onto the dock. The narrow path made us stand much closer than we would have otherwise. Being so near him made me remember what it was like to have his strong arms wrapped around me, and I blinked back more tears. That he didn’t even consider us friends stung more than I cared to admit. Jake gestured for me to walk in front of him. “There isn’t more, Riley.” Jake’s voice sounded tight, as if he was holding back anger. “You don’t know that.” My voice trembled, and I fought to quell the frustration rumbling up my spine. “All those people, Jake. They died and there has to be a reason. They can’t just have…” My voice broke, and I struggled to push back the sorrow that threatened to crush me. Three weeks ago, when I rushed into Jake’s parish frantic over my missing brother, he’d been there for me. Jake took me all over town and beyond trying to find Randy. Back when my brother was only missing and not a monster. Jake’s parish was barely back on their feet after Katrina and didn’t deserve what my brother did to them. They didn’t deserve to fear dying again. I nodded silently, and the two of us headed back up the dock to the soft grass of the bank where his squad car idled. I shrugged as I slid into the seat, not answering because I didn’t want him to hear the truth in my voice. “They don’t like that term.” I said, and tried to smile. My job as a reporter put me in contact with people from all walks of life. That some of their “talents” rubbed off on me wasn’t surprising. This wasn’t the first time Jake commented on my strange skill set. My family didn’t want me within twenty miles of this place. They probably hoped I’d get run out of town. “You liked this place when we came here together. You said you thought it would be a good place to hide and think.” He said it without looking away from the road; without looking at me, and I wondered if he remembered that he’d also kissed me that day. “You really want me to leave?” My heart fell at the thought of Jake not wanting me around. I wished he would smile. I wished I could still see something warm in his gaze. “Moving on,” I repeated slowly. He was right, but despite that fact, I was staying. I thought about my plans, what I had to do…for Randy’s sake, for my parents’ sake; and a quiver of fear shook through me. I wondered how long before my actions pushed Jake away for good. Q1. As a new Christian, Riley struggles with doubt over her faith. How are some ways the Bible can quell a crisis of faith? Q2. Jake struggles with guilt over his brother's death. Is there something God can help you forgive yourself over? Have you let something stand in the way of growing in Him? Q3. Riley often walks the line between her old and new life. Choosing on one occasion to break the law. Do you find it hard to resist things from your past? How might prayer help you to conquer this? Q4. After a tragedy takes the lives of some of the town's residents, we see how people deal with grief in different ways. How might you comfort a friend going through the loss of a loved one? Q5. 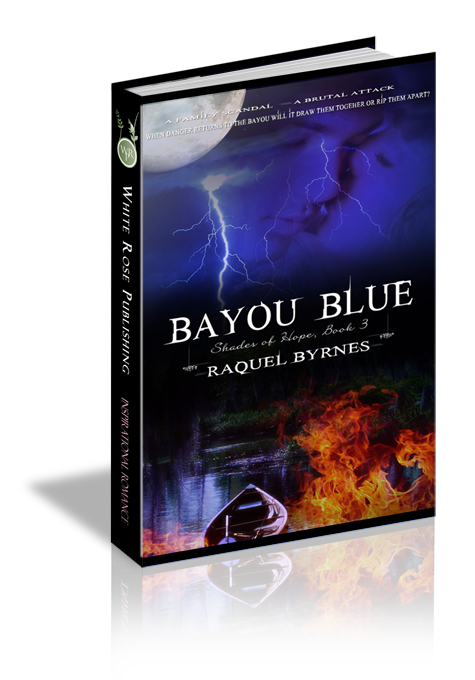 Some of the characters in Bayou Blue believe that the end result justifies their means. Though their intentions are noble, they hurt others. How is this an example of not waiting on the Lord's timing?